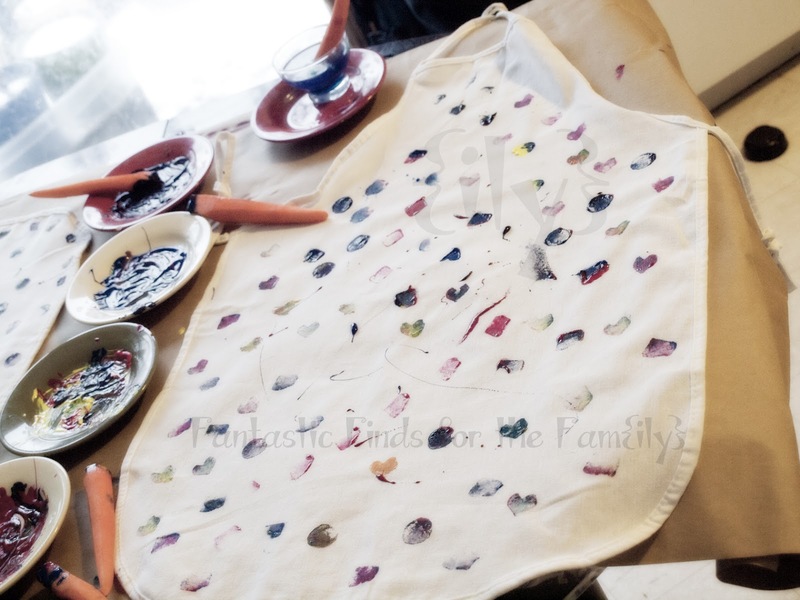 Going off of an idea from the Disney Family Fun website for making your own mosaic shirt, I decided that this Saturday at our Play Day, we'll be making aprons for all of our artistic ventures. 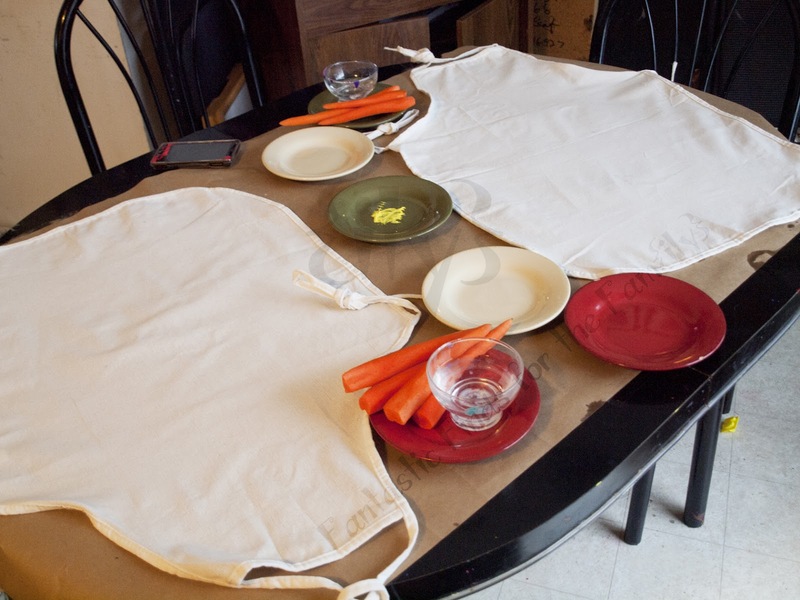 Something to be your apron: By this, I mean that you can do one of two things: you can A) go to the craft store, or the kitchen store, or goodwill or whatever and buy yourself a couple of aprons or you can B) upcycle one of your old white T-shirts or you can C) go and purchase a plain white T-shirt to upcycle. If you want to upcycle a tshirt to an apron, all you have to do is cut the sleeves and back shoulders off (leaving the hole for the neck, and use the lower part of the shirt to cut a piece that can tie in the back). I shopped around and found several options for aprons that you could buy, and after looking on Amazon and seeing that the cheapest one was around $15, I decided to take my chances with the local craft store. A stop at Michael's proved to be worth it, as I scored two aprons for just $1 each! 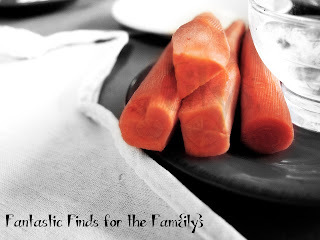 Carrots: You will cut these into shapes and they will be used as your stampers. 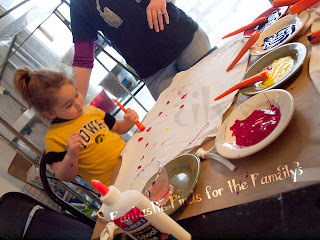 Fabric Paint or Ink: I used Fabric Screen Printing ink, since I had some lying around. Just make sure that you follow any setting instructions that are included with the ink/paint. 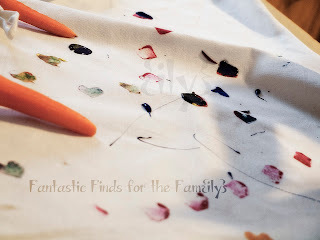 Mine said to let it air dry for a couple of hours, then to lay a paper bag or Kraft paper on top, and then iron for about two minutes to heat set the ink. 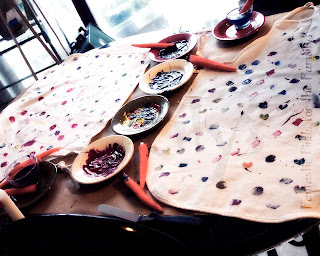 Unfortunately, while you're making aprons, you probably don't have one to wear... so make sure that you wear an old t-shirt that you don't care about when you do this project. That way you won't mourn stains on your clothing! Tip: Have everything all set up before you start. Your kids will get bored quickly if they have to wait for you to cut the carrots and prepare the ink. I laid out a piece of Kraft paper on my table so I wouldn't have any messes to clean up. Once you're all set up, all you have to do is roll up the kids' sleeves and let them stamp away! 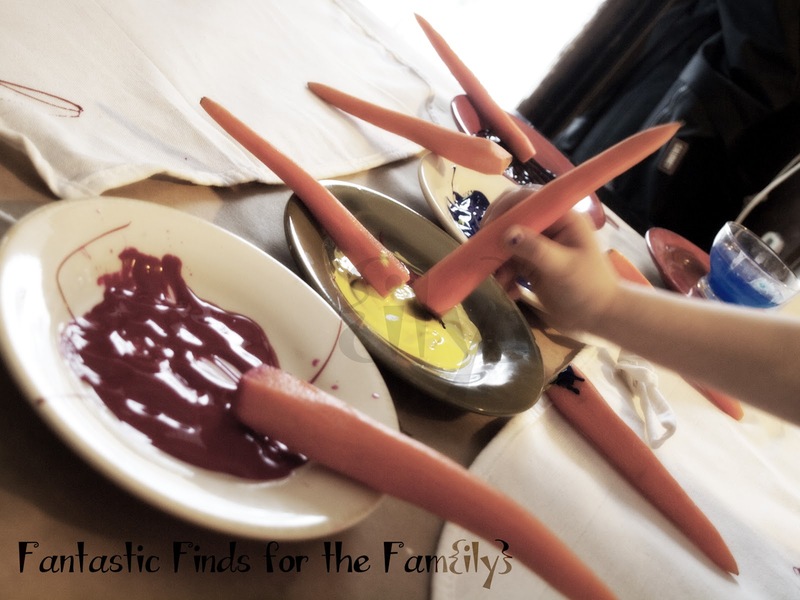 When they're all done, let the aprons air dry for a couple of hours and then heat set per paint instructions. Bernat's Crochet Along! Are you in?